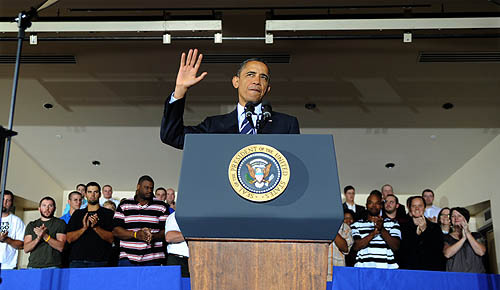 Oct. 11, 2011 – President Barack Obama blitzed the city to stump for his jobs plan today, delivering a 20-minute speech at the International Brotherhood of Electrical Workers hall on the South Side and then leaving town by 3:20 p.m.
Before his speech the president also met for more than an hour with a job-creating council of nationwide business, labor and academic leaders as they try to wrestle with the nation’s chronic unemployment problems. But Democrats have not been rushing to support the effort either, even in the Democratic-controlled U.S. Senate, which is set to take its first votes on the plan tonight, a month after the president forwarded it. Mr. Obama has been barnstorming the country to try to whip up popular support for his plan and left the city for a similar event tonight in Orlando, Fla., before traveling next to Detroit. Mr. Obama arrived on Air Force 1 around 11:15 a.m. U.S. Reps. Mike Doyle, D-Forest Hills, and Jason Altmire, D-McCandless, Mayor Luke Ravenstahl, and Allegheny County Executive Dan Onorato were on hand to greet the president. Mr. Obama then jogged to a group of about 45, and briefly shook hands and gave autographs. “I want to make sure he gets support. During these times, it seems he might not be getting a great deal,” said Darryl Spivey, 47, an insurance executive from Allison Park. Jennifer Hess got a pass from Fort Allen Elementary in Hempfield to bring her three boys, ages 5, 8 and 9. “It’s worth missing school to see the president,” said Eric Hess, a 4th grader and the oldest. Mr. Obama arrived at IBEW headquarters just before noon and met with two sets of union trainees. The first group showed him how to bend a pipe and get a true, calibrated angle. The second set showed him how to fire electric motors. Mr. Obama asked everyone how long they’d been training. “I’m in my first year but I know pretty much everything” said one young man. The president then sat down with the 30-member President’s Council on Jobs and Competitiveness. He said he had read their report last night, and thanked them for it. He stressed he would act even without congressional approval of his whole jobs bill — federal agencies are “scouring” the bill to find things that can be done administratively, he said, and could approve planks piecemeal as well. Steelers chairman emeritus and ambassador to Ireland Dan Rooney was quietly sitting with the press in a back row. The crowd of 200-plus was rather quiet during Mr. Obama’s speech, but energized during Mr. Obama’s remarks on getting construction workers jobs and minimizing sending jobs overseas. 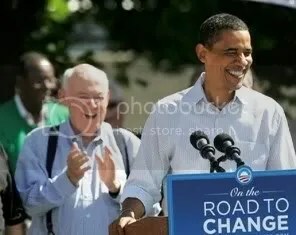 Mr. Obama worked the rope line briefly then hit the road with 20-vehicle motorcade by 2:45 p.m. The doors closed on Air Force 1 at 3:14, and it was in the air at 3:20 p.m. Tim McNulty: tmcnulty@post-gazette.com. From the beginning of this country till President Ronald Reagan, the success of the United States was based on the American Plan. We would manufacture goods and sell them to the world. Tarrifs were put on imports to make them cost more than domestic made products. We were to keep out of foreign wars and sell supplies to both sides. Work was plentiful and the citizens contributed to the common wealth. Corporate taxes in the 1950’s was 90% minus write offs for growth. So if a company invested in to growing and creating more jobs , there was no tax. It was a WIN, WIN, & WIN situation for the companies, government, and workers.Then came the demons from the dark side , with their “B” movie star , to destroy an envied economic system with Greed. They now are the kings and barons from the old europe that our forefathers declaired war on. They own all the wealth and the rest are subservants. This economic system will fail if consumers don’t have money to support it. Then so goes our democratic style of government.Fascist leaders are lineing up for the kill. With the monopoly of big box stores, the same people owning the media with journalist being replaced with infomercials and reporters, a military industrial complex that dosn’t report what they spend to the taxpayers, we are out of controll. The hope of the world ( America) is being lost daily.